Poland is leading the way for the countries of New Europe, as much of the old Eastern Bloc surges out	of the Cold War and into the 21st century. Two world wars rolled across Poland's countryside and	there is much remaining physically and emotionally. The borders shifted east and west, but since the	1990s and particularly since joining the EU, Poland is looking towards a bright future. It was a family trip to Krakow in late 2014, for a family wedding uniting Scotland and Poland, that was my first foray into this part of Eastern Europe. Either we were lucky with the weather, or it's	always that way in the autumn as there were warm, sunny days for much of the trip. As it was a celebratory	visit, we elected to steer clear of Auschwitz which we felt would not have been appropriate	to visit at that time. Wawel Castle on the banks of the Vistula River is the old fortified centre of Krakow, and a very grand	place indeed. Built in the 14th century and remodelled over hundreds of years, it now houses an art	gallery and museum. Our hotel was just along the riverside from here. 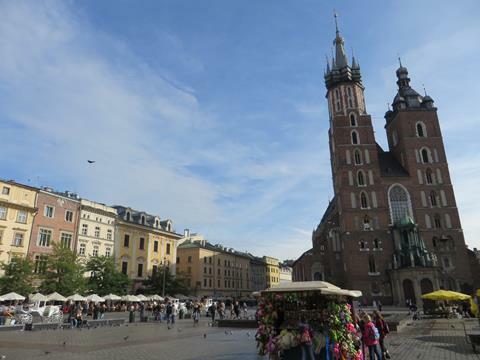 The Main Square of Krakow's Old Town, or Stare Miasto as it is locally known. The whole old town is	a World Heritage Site, and it's clear to see why. Underneath the town square is a comprehensive exhibition	of the town's history. 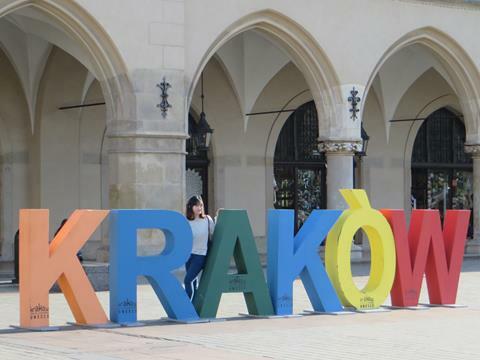 A tourist poses with the colourful Krakow sign in the main square, outside the Cloth Hall. 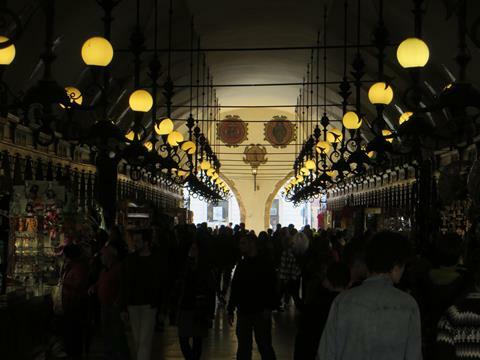 Inside the Cloth Hall, which now serves as a market place selling all sorts of souvenirs and bric-a-brac. It wasn't always this way, as the Cloth Hall was built as a major trading centre in the 15th	century and dealt with all manner of commodities from far and wide. 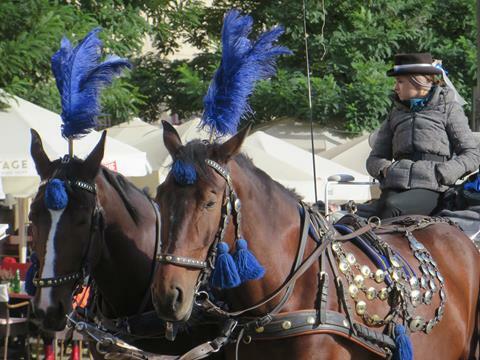 Horses and drivers line the main square, ready to take tourists for a trot. 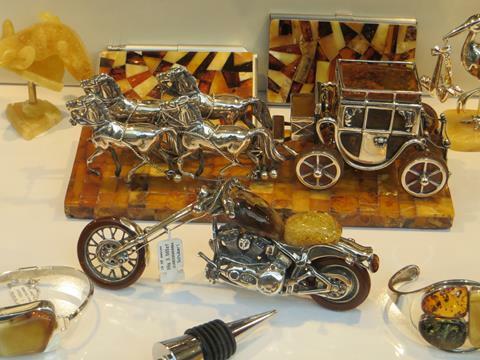 An altogether more elegant form of horse-drawn transport can be seen in amber, at one of the city's many amber shops. 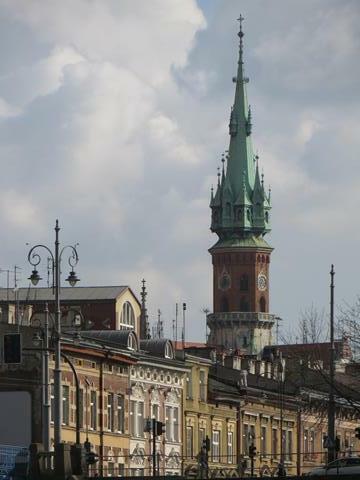 The Church of Saints Peter and Paul, on Grodzka leading up to the main square. 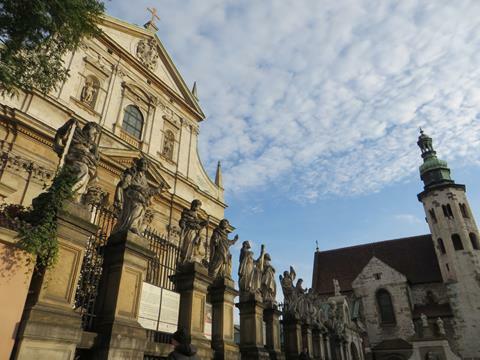 It is the largest church	in Krakow and was built in the early 17th century. I like this photo particularly for the texture	of the sky, and the lined up statues in front of the church. Another Peter and Paul place I have	visited is the fortress by that name in St Petersburg. 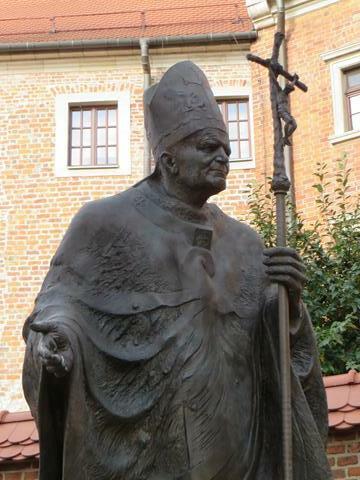 Karol Jozef Wojty or Pope John Paul II as he was latterly known, was of course Polish and turned around	the eponymous phrase regarding a Pope's nationality. He was born in Wadowice, not far from Krakow,	and served as Pope from 1978 until 2005. I was fortunate enough to see him in person in the Vatican just	a few months before he died. Inside Wawel Castle the grounds are kept very pretty and we sat in a cafe for a while in the sun. Amongst	other works, the museum was exhibiting Leonardo da Vinci's "Lady With An Ermine", one of only	four female portraits he painted, along with the Mona Lisa in Paris. We also visited the Collegium Maius, part of the Jagiellonian University, Poland's finest. 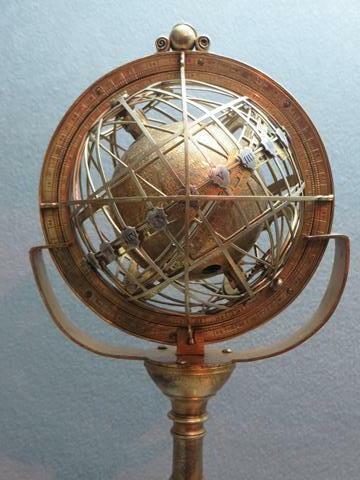 It was here	that Nicolaus Copernicus studied, using such instruments as the Globus Jagellonicus seen here, the	oldest surviving globe to represent the Americas, dating from 1510. The Church of St Joseph stands as a stark landmark on the south side of the Vistula. Despite its old	appearance, it was built just after the turn of the 20th century. I took this as we were walking	a circuit around the river near the old town. 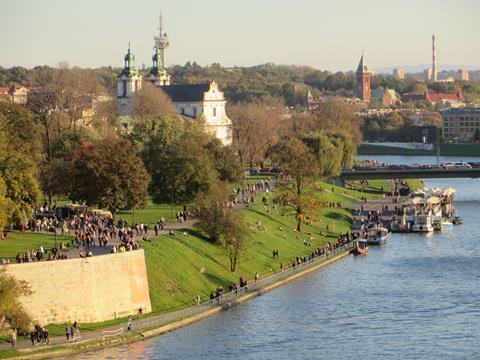 The Vistula river wends around the south of the old town of Krakow, and is flanked with substantial	embankments to contain it after heavy rains. Further downstream it flows through the capital Warsaw,	before discharging into the Baltic Sea at Gdansk. 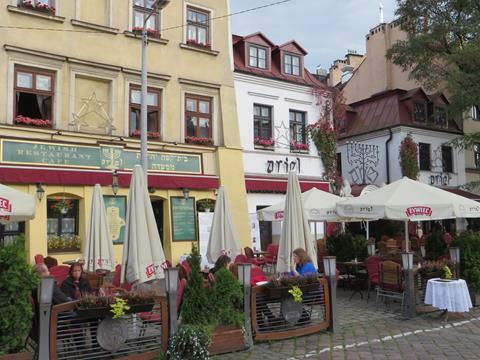 Krakow's Jewish Quarter was all but decimated during the war, with most of its population being holed	up in the walled ghetto south of the river, and ultimately taken to Auschwitz or Plaszow. 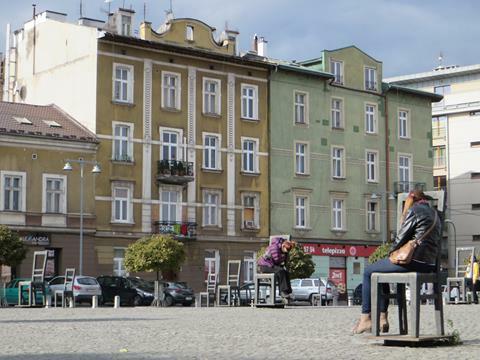 The recovery	has been slow, but there is a small community building up again in Kazimierz. We went to this	restaurant for dinner. 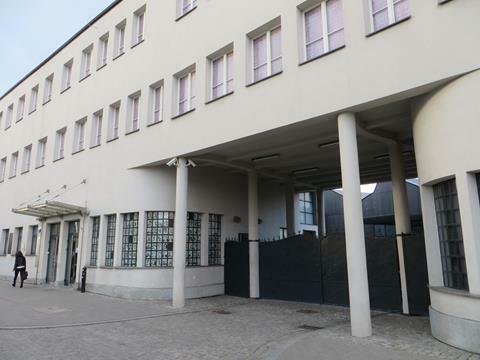 Oskar Schindler, the German industrialist, ran this factory in Krakow during the war. By recruiting	workers from the nearby Jewish ghetto, he was able to prevent the deportation of over one thousand	to the concentration camps. The story was portrayed in Steven Spielberg's 1993 film "Schindler's List". The Jewish ghetto has been reintegrated as part of the city, however some of it is still in a state	of disrepair. From this square the residents were deported at the liquidation in 1943. Each memorial	chair represents one thousand people. 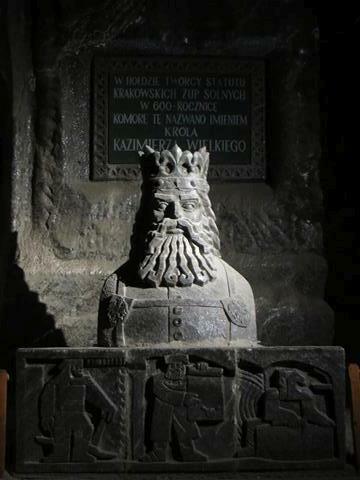 In the town of Wieliczka outside the city is one of the world's largest and oldest salt mines. 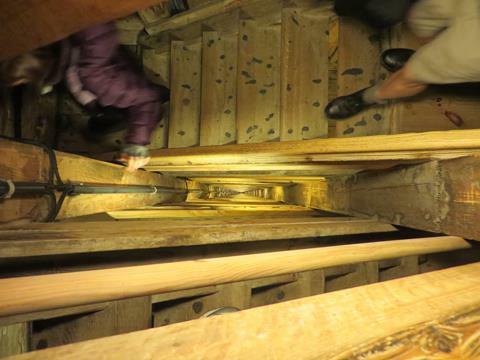 We entered	by walking down a shaft descending 64 metres underground, before following a series of tunnels	over two miles until we were twice as far underground. 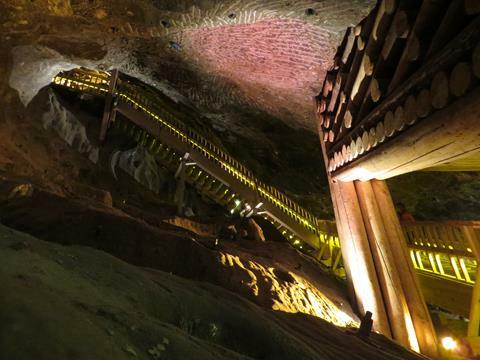 The salt mine dates back to the 13th century, and it was amazing to see some of the woodwork and walk	through tunnels built hundreds of years ago. Throughout the mine are various statues and carvings all cut from rock salt, and produced by the miners	themselves. This regal chap looks as if he's just stepped out of a dwarf mine in "Lord of the Rings". 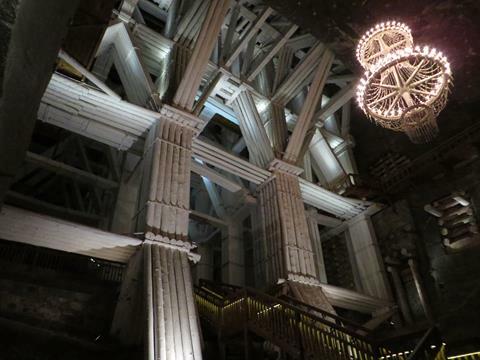 A giant chamber deep underground, lit by rock salt chandeliers. Whilst the tour took all afternoon,	we explored only a fraction of the mine's corridors, which stretch over one hundred miles. 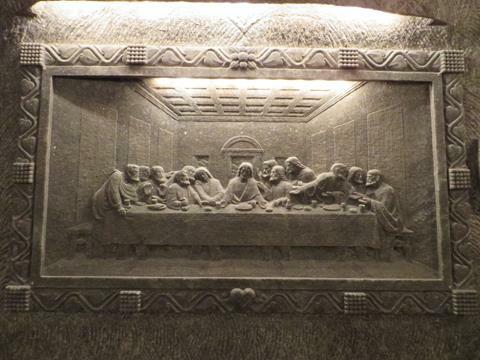 Salty artworks abound in the mine, my favourite was this representation of Leonardo's Last Supper, complete	without the doorway cut through it, as is the case with the original in Milan. 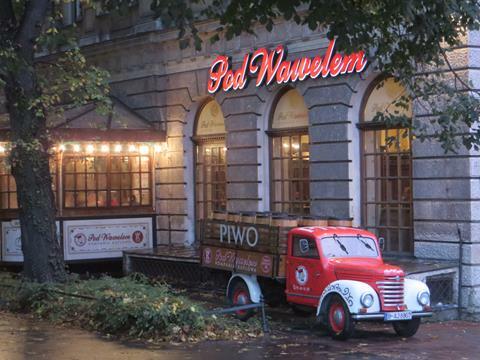 A historic beer truck leaves us in no doubt as to what's offered by this establishment. Walking back to our hotel along an atmospheric leafy lane. 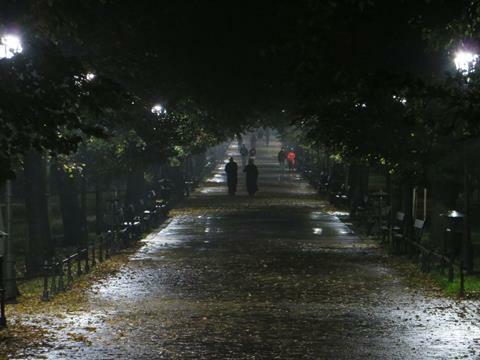 This is a stretch of the park that encircles	the old town completely.